Why did Sierra Leone experience such a protracted civil war between 1991 and 2002? Sierra Leone has been beset with challenges since achieving independence from Britain in 1961, in particular its brutal civil war that resulted in tens of thousands of deaths and the displacement of almost a third of the total population. Yet Sierra Leone is now one of the more stable countries in West Africa due to its recently re-established democratic government and increasingly transparent, peaceful, and credible elections since 1996 following a series of turbulent regime transitions. This has finally resulted in the representation of multiple ethnic groups and political parties within the national government. Economically, however, Sierra Leone remains an extremely poor nation with tremendous income inequality despite its substantial mineral, agricultural, and fishery resources. As a nation heavily reliant on primary commodity exports (see graph on page 38), Sierra Leone continues to depend on alluvial diamond mining as its major source of hard currency earnings, accounting for nearly half of all exports (CIA World Factbook). Since diamonds are not prone to sudden depreciations in value, they are therefore a more stable form of currency than the Leone). In addition to its abundance in highly valuable natural resources, Sierra Leone boasts an ethnically diverse population with multiple prominent ethnic groups, each predominantly occupying a particular region and possessing a unique cultural history and language. The dependent variable examined in this paper is civil war. In particular, it seeks to investigate what factors led to the brutal eleven-year civil war in Sierra Leone. 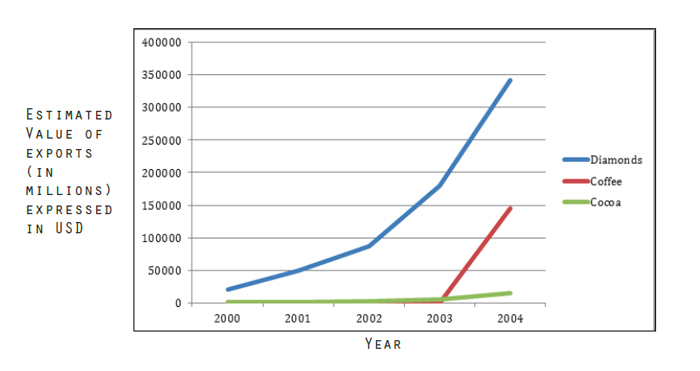 The lengthy duration of conflict in Sierra Leone is an atypical case as it exceeds the average nine-year duration of armed conflict for countries in Sub-Saharan Africa between 1945 and 1999.1 However, the causes for this inconsistency are not readily apparent, because Sierra Leone— like its Sub-Saharan African neighbors—also possesses significant ethnic diversity and has experienced repeated regime transitions (see graph on page 38 for estimated ethnic group population shares). During the course of the eleven-year civil war, Sierra Leone underwent multiple regime transitions among different forms of authoritarian rule, from one-party systems to military regimes, before the ultimate emergence of a democratic administration. Some scholars hypothesize that the presence of a weak government during a period of regime transition may prolong civil war because insurgents are better able to thrive if the government and military to which they are opposed are relatively weak.4 A weak government is defined as one that is badly financed, organizationally incompetent, corrupt, politically divided, and poorly informed at the local level.5 However, this explanation does not sufficiently explain Sierra Leone's prolonged civil war between 1991 and 2002, because Sierra Leone did not experience civil war between 1978 and 1990 despite multiple regime transitions and a series of weak governments during that period. Surprisingly, Sierra Leone has today become relatively stable due to its recently re-established democratic government and increasingly transparent, peaceful, and credible elections— implemented since 1996 during the height of the civil war conflict. Moreover, despite multiple regime transitions throughout the eleven-year conflict, Sierra Leone's governments and military opposing the rebel movement cannot be considered particularly weak in terms of either corruption or organizational incompetence. This fact is exemplified by the Ernest Bai Koroma administration's multi-faceted efforts since 1997 to implement more transparent leadership in Sierra Leone. First, the administration sought to fight and prevent corruption by establishing an anti-corruption commission to investigate and prosecute suspect government officials. In addition, it initiated a wide-scale public sector reform program to reduce and prevent wasteful government spending. Since government administrations during the civil war had recognized and sought to tackle corruption and organizational incompetence while strengthening their capacity to impose regulations, Sierra Leone's prolonged civil war cannot be explained by the presence of a weak government during a period of regime transition. Other scholars hypothesize that an ethnically diverse population may prolong civil war because ethnic wars, defined as wars among communities in conflict over the power relationship existing between them and the state, appear to last longer than non-ethnic wars.6 The logic underlying this argument is that opposing communities in ethnic civil conflicts are believed to hold irreconcilable visions regarding the state's identity, borders, and citizenship. For this reason, opposing ethnic communities do not seek to control a state in which all ethnic groups accept the existing identity of the state, but rather seek to redefine—often through violent means—the very identity of the state itself. This, however, is not the case in Sierra Leone, a country in which none of the major ethnic groups, including Temne, Mende, Limba, or Kono, have sought to monopolize the identity of the state itself. Instead, these groups' political aim was to obtain equal political representation within the national government, a goal that has now largely been achieved. But this explanation also fails to explain the cause of prolonged civil war in Sierra Leone, since multiple ethnic groups have been represented in national government since independence, and different ethnic groups are accorded equal political and civil rights. Finally, ethnic diversity is believed to be especially problematic for domestic stability if a single ethnic group accounts for forty to sixty percent of the overall population and is able to dominate the others. 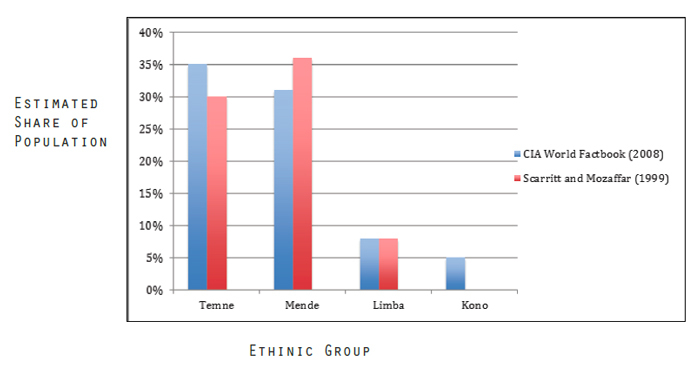 In such polarized societies, it is theoretically easier for insurgents to sustain a rebellion.8 However, ethnic polarization was not a factor during the Sierra Leone civil war, as no single ethnic group accounted for forty to sixty percent of the overall population (see graph on page 38). In summary, explanations based on ethnic diversity are insufficient to explain the prolonged nature of the civil war in Sierra Leone. 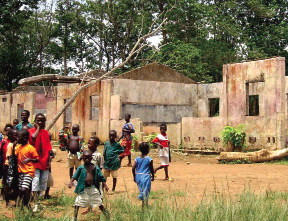 The RUF destroyed schools like this one in their campaign to "restore power and wealth to the people"
In addition, the availability of certain commodities that can be easily looted because they are highly valued or geographically concentrated creates further opportunities for rebel predation. Countries that possess valuable commodities like diamonds or gold are therefore at higher risk of experiencing prolonged conflict, because the opportunity to loot and tax such commodities not only enables but encourages rebels to sustain conflict. Lengthy civil wars can only occur when rebel groups are able to sustain large organizations by securing the financial resources necessary to continue waging warparticularly through control of natural resources. The mechanisms through which natural resources affect the likelihood of prolonged civil war are illustrated in Sierra Leone's civil war. Because prolonged conflict is often motivated and enabled by predation of natural resource exports and valuable commodities, Sierra Leone is an ideal case to test this hypothesis due to its abundance of easily extractable natural resources, particularly diamonds.13 The availability of certain commodities that may be easily looted as a result of their value and geographic concentration creates opportunities for rebels to forcefully seize and subsequently tax them to fund continued insurgency. The claim that enclave production is particularly likely to cause prolonged civil war appears true in the case of Sierra Leone. 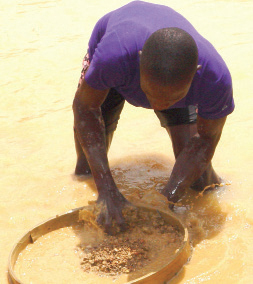 The country's many easily extractable natural resources, most notably alluvial diamonds, allowed the rebel movement to continue funding its operations and thereby sustaining the conflict.17 The Eastern and Southern regions of Sierra Leone are abundant in these diamonds, which are accessible to anyone with a shovel and sieve. The Revolutionary United Front was thus able to fund its military action through illicit trade in conflict diamonds. 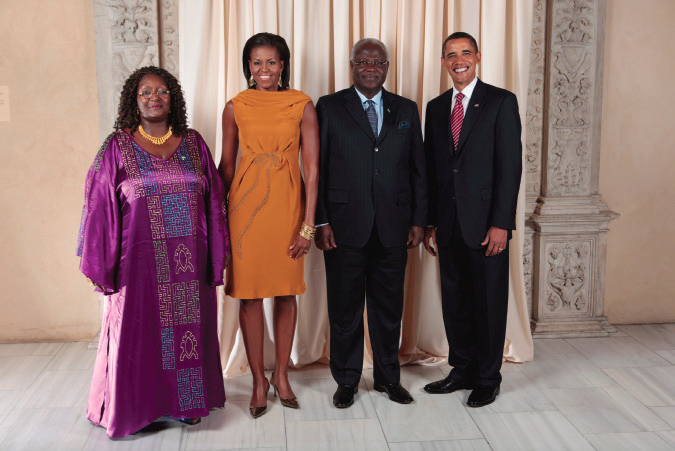 Specifically, the Revolutionary United Front used funds from alluvial diamond mines to purchase weapons and ammunition from neighboring countries such as Guinea and Liberia.18 The fact that trade in conflict diamonds prolonged the civil war in Sierra Leone is reflected by International Criminal Court's recent conviction of Liberian president Charles Taylor for his role in sustaining the conflict by trading weapons and military training for diamonds, thereby enabling the Revolutionary United Front to sustain its brutal campaign. “CIA World Factbook.” CIA Library. Central Intelligence Agency, n.d. Web. 28 Sept. 2012. <https://www.cia.gov/library/publications//the-world-factbook/geos/sl.html>. Collier, Paul. “Primary Commodity Dependence and Africa’s Future.” Annual World Bank Conference on Development Economics 2003. New York: Oxford University Press, 2003. 139-62. Print. Collier, Paul, and Anke Hoeffler. “On the Incidence of Civil War in Africa.” Journal of Conflict Resolution (2002): 13-28. Web. 27 Nov. 2012. Elbadawi, Ibrahim, and Nicholas Sambanis. “Why Are There So Many Civil Wars in Africa? Understanding and Preventing Violent Conflict.” Journal of African Economies 9.3 (2000): 244-69. Web. 27 Nov. 2012. Fearon, James, and David Laitin. “Ethnicity, Insurgency, and Civil War.” American Political Science Review 97.1 (2003): 75-90. Web. 27 Nov. 2012. Gberie, Lansana. A Dirty War in West Africa: The RUF and the Destruction of Sierra Leone. Bloomington, IN: Indiana University Press, 2005. Print. Leonard, David K., and Scott Straus. “The Causes of Civil Conflict in Africa.” Africa’s Stalled Development: International Causes and Cures. London: Lynne Rienner, 2003. 57-82. Print. Sambanis, Nicholas. “Do Ethnic and Non-Ethnic Civil Wars Have the Same Causes? : A Theoretical and Empirical Inquiry (Part 1).” Journal of Conflict Resolution (2001): 259-82. Web. 27 Nov. 2012. Scarritt, James, and Shaheen Mozaffar. “The Specification of Ethnic Cleavages and Ethnopolitical Groups for the Analysis of Democratic Competition in Contemporary Africa.” Nationalism and Ethnic Politics 5.1 (1999): 82-117. Print. Weinstein, Jeremy M. Inside Rebellion: The Politics of Insurgent Violence. Cambridge: Cambridge University Press, 2007. Print.